Brainwashed - Marisa Anderson, "Cloud Corner"
Marisa Anderson has quietly been one of the most reliably excellent solo guitarists around for years, slowly amassing a fine discography of limited releases that occasionally get a well-deserved reissue. The handful that I have heard, however, do not quite capture the full extent of Anderson's powers, as it has historically been very easy to lump her in with the overcrowded post-Fahey milieu. On Cloud Corner, her Thrill Jockey debut and most high-profile release to date, she simultaneously celebrates and transcends her folk/blues origins, drawing in Spanish and Taureg influences and fleshing out her sound with a host of effects, added instrumentation, and overdubs. It is remarkable how much difference making full use of a studio can make: Anderson's virtuosity and gift for strong melodies remain as delightful as ever, but her work has never sounded quite this vibrant, varied, and evocative. Cloud Corner is definitely Anderson's finest release to date (and occasionally also the best album that Six Organs of Admittance never recorded). The album opens in remarkably lovely fashion with "Pulse," as Anderson unleashes a brightly rippling cascade of arpeggios that leave a shivering cloud of lingering harmonies in their wake. She also makes wonderfully stealthy and effective use of electric piano, weaving a languorous trail of quivering, liquid tones in the background to add further color and depth to the haze of overtones. While "Pulse" is just one of many stylistic threads that Anderson explores over the course of this multifarious album, it does set the tone for the overarching aesthetic that runs throughout Cloud Corner: vibrant and vivid melodies that dissolve into gently hallucinatory ghost trails. To her credit, Anderson seems to have found the perfect balance between casual virtuosity, psychedelia, brevity and songcraft. 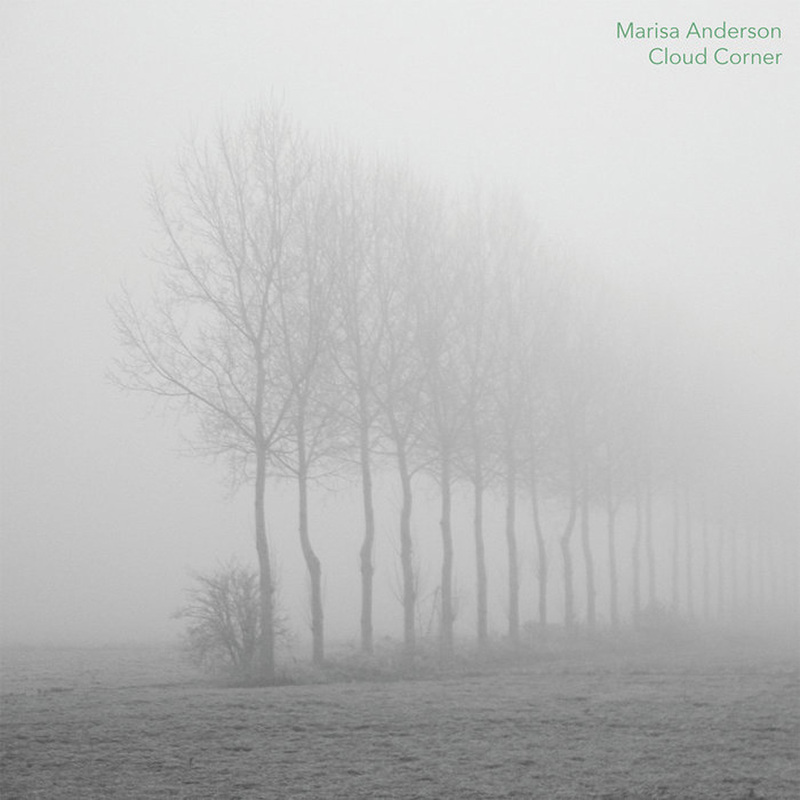 Cloud Corner never feels consciously flashy or indulgent–instead it feels like Anderson is playfully embellishing her favorite melodies in a magical forest where sounds embark upon a spectral second life rather than decaying into silence. Anderson covers a lot of varied territory within those enchanted confines though. For example, "Slow Ascent" is a droning and serpentine Eastern blues piece enlivened by tumbling flurries of pull-offs, while the following "Angel's Rest" is a radiant and tender reverie. The title piece that follows is then something completely different altogether, taking the shape of a lively, breezy bit of folk guitar that combines a strong melody with some quietly dazzling interplay between the underlying arpeggios. On the latter two pieces, Anderson proves to be especially adept at dabbling in major keys without sounding lightweight or saccharine. She also has a real knack for ending songs at exactly the right time, as none of these ten songs ever comes close to overstaying its welcome. Anderson returns to Eastern-tinged psych-folk with "Sun Song," though she perversely eschews effects, opting instead to unleash an acoustic tour de force that sounds like Ben Chasny might if he became extremely enthusiastic about Spanish guitar music and grew a few extra fingers. The sun-dappled "Sant Feliu de Guíxols," on the other hand, seems to be Spanish in name and inspiration only, beautifully recapturing the warmth and momentum of the earlier "Cloud Corner." Amusingly, it was partially inspired by a fan who lamented that Anderson only plays "sad songs." She seems to have taken that observation very much to heart, as it feels like Cloud Corners is composed of far more light than shadow. In fact, Anderson only truly delves into darkness with "Lament," a gorgeously winding and elegiac slide guitar and electric piano piece inspired by images of Syrian refugees. The electric piano takes a more prominent role in the desert blues of "Surfacing," beautifully winding through an otherwise straightforward piece like a lysergic, shimmering stream. The album then closes with its most unusual piece ("Lift"), which seems to be the album's leftfield single of sorts (there is a video for it). I do not foresee it making much of a commercial impact, sadly, but it is appealingly strange and lovely. It is also quite minimalist, as it is built from an endlessly repeating ascending melody that is rhythmically washed over by a slow tide of shimmering electric guitar chords. As much as I have enjoyed Anderson's previous work, I was kind of blindsided by how dramatically her art has expanded and evolved with Cloud Corner. In one sense, it feels like a wonderful compilation featuring four or five guitarists with different cool aesthetics. In a more crucial sense, however, all of the different threads seem to feel completely natural and like they all belong together as essential elements of this lovely whole–like different stages of a long and meaningful journey with a very conscious and purposeful arc. I cannot think of anyone else who could have made an album quite like this, as these pieces feel steeped in a reverence for traditional music, yet adventurous and experimental enough to feel like something fresh. It is no small feat to embrace and transcend traditional music at the same time, especially without seeming like one is self-consciously trying too hard to make an important statement. Cloud Corner instead feels natural and comfortable. This is simply a fundamentally transcendent album in nearly every significant way, transcending stylistic boundaries, cultural boundaries, my own expectations, and the (normally) limited appeal of solo guitar albums. Of course, while all of that is true, it feels uncomfortably like hyperbole for such a lovely, understated, and lived-in batch of songs. Perhaps it is better to merely say that Cloud Corner feels like making a new friend that I feel like I have known forever. It is not a toweringly grand and ambitious masterwork, but it is easily one of the most enduring and instantly endearing albums that any guitarist will release this year.